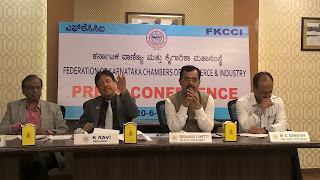 FEDERATION OF KARNATAKA CHAMBERS OF COMMERCE & INDUSTRY. and deliberate on matters of Regulation & Taxation. announce certain milestones achieved during his tenure as President. 1.Bhumi Puja was done yesterday for " FKCCI Skill Development Centre"
2.FKCCI will be organising CSR Conference & Awards on 21st June,2018. 3.Launching of Digital FKCCI on the lines of Digital India. Language centre to teach Japanese to start with and also Chinese. as it would help in ease of doing business & also avoid red tapism.